Football has become the most popular outdoor game in the world. Its fans are more than any other sports of the world. Its not easy to play the Fifa world cup for any team. Now there is going to held Fifa world cup 2018 in Russia. First match will be played between Saudi Arabia and Russia on 14th of June 2018. All teams have been divided in 8 groups i.e a, b, c, d, e, f, g and h. Some Muslim countries have also qualified for Fifa football world cup 2018 like Tunis, Iran, Saudia Arabia, Morocco, Nigeria and Egypt. Which one of these is your favorite team. Fifa world cup schedule 2018 has also been announced by the world cup organizing committee. We have reproduced this Fifa world cup schedule 2018 on this page both in Urdu and English languages. If you are a football lovers then you may find lot of other interesting information on this page in Urdu language. Soon schedule of final round will also be shared for you. 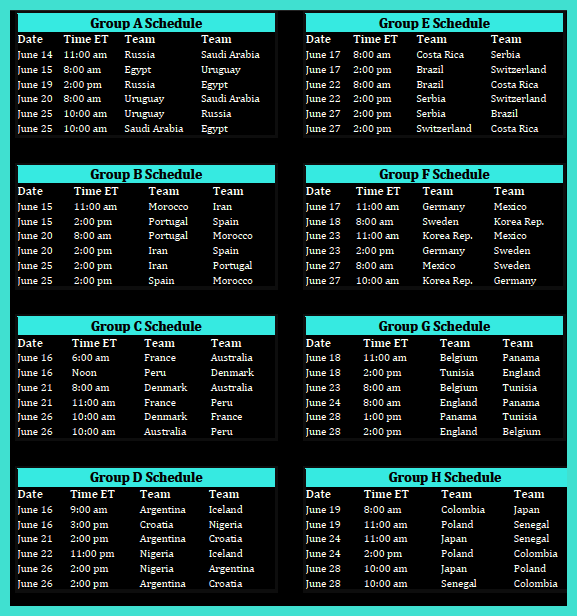 Hopefully you will love to share this Fifa world cup 2018 schedule. There is great talent of football in Pakistan, but unfortunately our team could never qualify for FIFA soccer world cup. Pakistan government is not patronizing this game and this is the main reason of our low performance in soccer. Even then our team has won street children world cup. Lyari area of Karachi is the main hub and breeding area of soccer in Pakistan. Hopefully in near future team Pakistan will be able to play Fifa world cup. Our best wishes are with team Pakistan. Keep visiting arqumhouse.edu and its official facebook page for latest updates about Fifa World Cup 2018.